A concluding event for the OSOS Project was held at the Sci-Tech Rose and Sci-Tech Aliyah Shniya junior high schools in Acre. 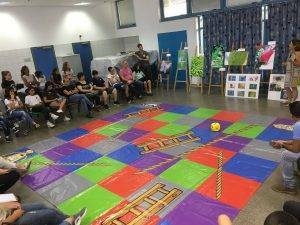 The students and their parents gathered in the city’s ‘Eshkol Payis’ Community Center, where they presented the fruit of their labor during the project: a giant Snakes & Ladders game, comprising quiz cards with questions about their city, which were divided to five categories: nature & flora, geometrical structures in the city, streets and neighborhoods named after artists and intellectuals, archeology, and physics. The game was designed to encourage young Acre residents to get to know their city in a fun, engaging way. In order to design the game’s tasks, and to research the different categories, the students were assisted by various subject teachers in their school, and even met with several experts in the surrounding community. A different group of students met with blind people and people with impaired vision from the community. As a result of this meeting, the students added Braille transcriptions to the quiz cards, to make them more accessible. In addition, a group of students had a meeting with the deputy director of the Education Department in Acre Municipality, who found their plan interesting and took on its implementation in the local-interest curriculum of the city’s primary schools. As a result of this meeting, the students will take their game to several schools in the city in the next academic year. The OSOS Project is implemented in Acre in cooperation with the parents of Elior Price, a graduate of the Sci-Tech Akko Vocational High School, who died at the age of 26, in the July 2012 suicide bombing attack in Burgas, Bulgary. OSOS (Open Schools for Open Societies) is an international project sponsored by The European Union, aiming to connect educational institutions with their local communities. In Israel, the project is led by the Israel Sci-Tech Network’s R&D Center, along with the Bloomfield Science Museum in Jerusalem.